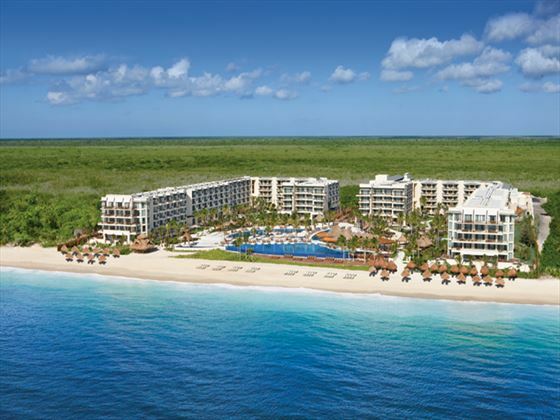 Luxurious and relaxed, Dreams Riviera Cancun is one of the most popular resorts in Mexico – and it’s not hard to see why. 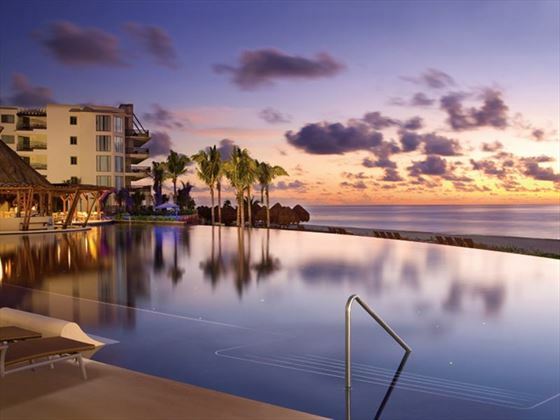 The location is excellent; you’re set on a gorgeous beach, surrounded by tropical gardens, steps from the pristine white sand and only a short journey from the fun nightlife of Cancun – truly everything you want is right here. We love the excellent pool area which has a lovely swim-up bar. It’s so good you almost forget that you’re just seconds from the stunning blue of the Caribbean Sea. 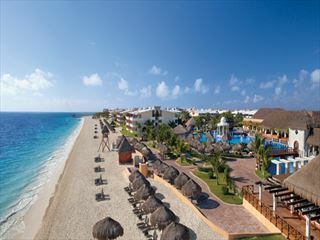 Swap the resort for the beach and you’ll find ample space to sunbathe and a number of fun watersports on offer. 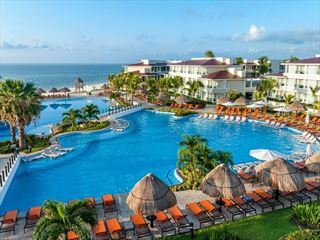 Enjoy the Unlimited-Luxury® all-inclusive package, take a cocktail-making lesson, go cycling or enjoy a game of beach volleyball; there really is so much to do here. And if none of it catches your eye, you can always just lay back and soak up the sun in one of the most beautiful locations in the world. Top Tip: The hotel offers a number of excursions to Mayan ruins and other great local sites – they are definitely worth checking out. 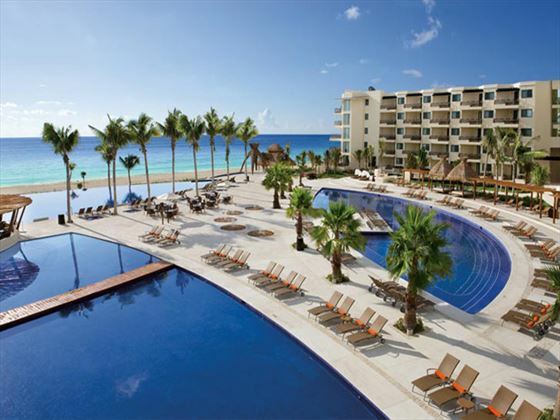 This fun resort benefits from a vibrant and lively location between Cancun's southern tip and Playa del Carmen, in a town called Puerto Morelos. Flanked by a golden sand beach, you're never too far from exciting watersports, whilst the 40-minute trip to Cancun will bless you with fabulous restaurants and even more sun-drenched spots. 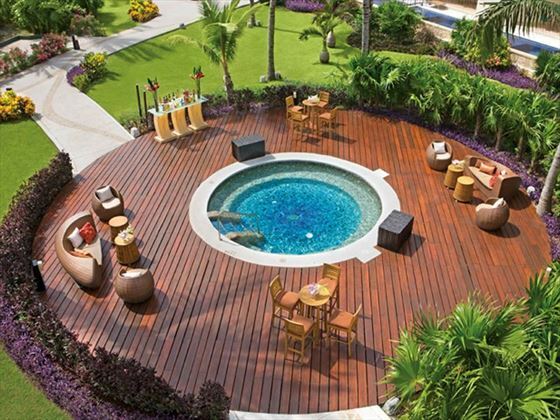 Premium Deluxe Tropical and Garden View - with fabulous views of the gardens and beyond. 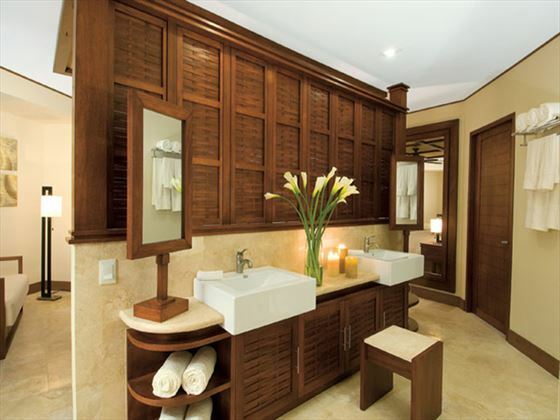 Premium Deluxe with Plunge Pool - with a spacious terrace with plunge pool and indoor jacuzzi. 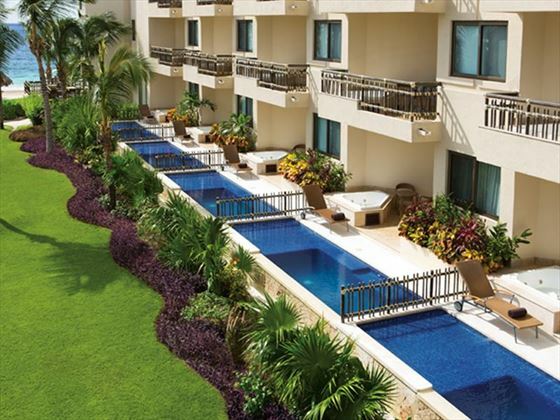 Located on the ground floor with spectacular views of the gardens or pools. 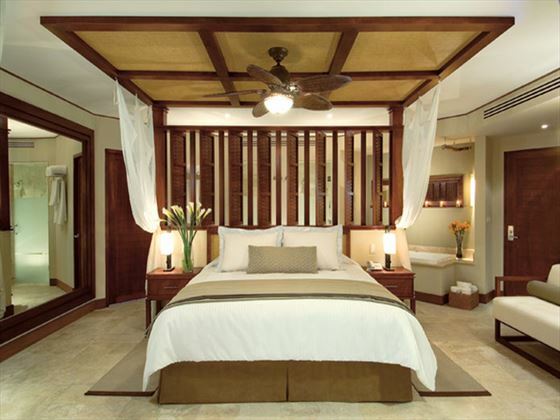 Premium Deluxe Ocean View - with an indoor jacuzzi and fantastic views of the Caribbean Sea. Preferred Club Premium Ocean View with Exterior Jacuzzi - offering an indoor jacuzzi and a spacious terrace with an outdoor jacuzzi. This suite features spectacular ocean views. Preferred Club Premium with Exterior Jacuzzi and Plunge Pool - offering an indoor jacuzzi and a spacious terrace with both an outdoor jacuzzi and plunge pool. Preferred Club Ocean Front Honeymoon Suite with Outdoor Jacuzzi - offering marble floors, a king bed, desk, spacious terrace with outdoor Jacuzzi. 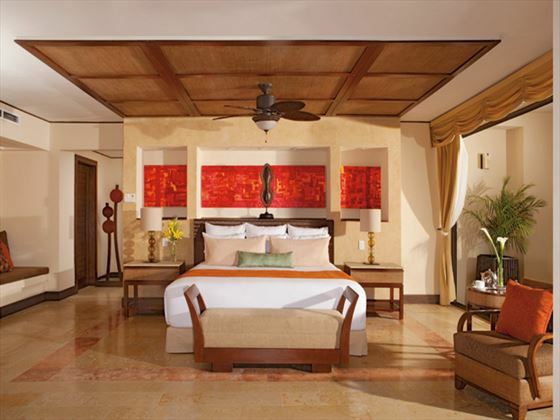 This suite features spectacular ocean front views. Preferred Club Ocean Front Master Suite - offering a separate living area, separate dining area, fully-equipped bathroom with separate shower, a desk and a spacious balcony with exterior jacuzzi. 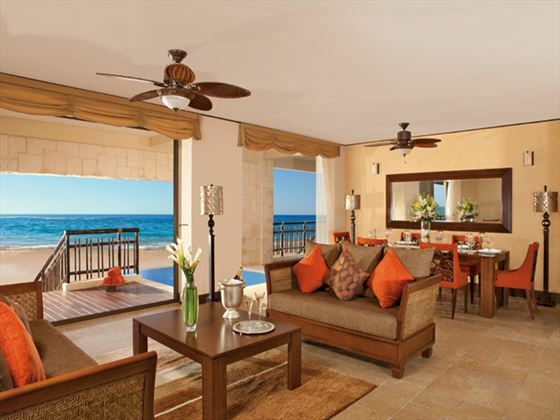 This suite features spectacular ocean front views. World Cafe - buffet style restaurant open for breakfast, lunch and dinner offering a variety of speciality international items and classics. Seaside Cafe - open for dinner serving grilled favourites presented in a quiet and romantic seaside setting. El Patio - open for dinner serving Mexican cuisine and Tex-Mex classics. Bordeaux - open for dinner serving French cuisine in a romantic and adults only environment. Himitsu - open for dinner serving a fusion of Pan-Asian and Oriental delicacies. Portofino - open for dinner serving Italian-Mediterranean cuisine. 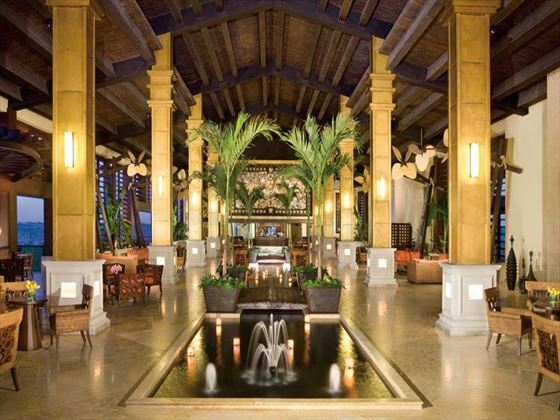 Oceana - open for breakfast and lunch, and for dinner serves the freshest gourmet seafood. Barefoot Grill - open for lunch serving light lunch options in a casual and relaxed outdoor setting. CoCo Cafe - open throughout the day offering premium coffee and deli snacks. 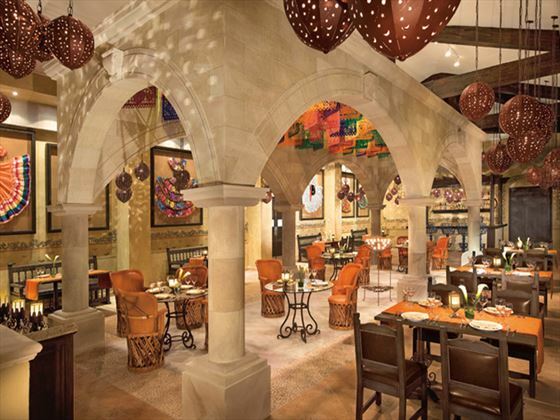 This hotel offers a ’No Reservations’ policy in all its restaurants. Private Candelight Oceanfront dinners can also be arranged at an extra charge. Explorer’s Club for Kids, exclusively for children ages 3 – 12 with fully supervised activities by Red Cross certified staff open from 9:00 am to 10:00 pm offering a different daily programme based on science, nature and exploration. 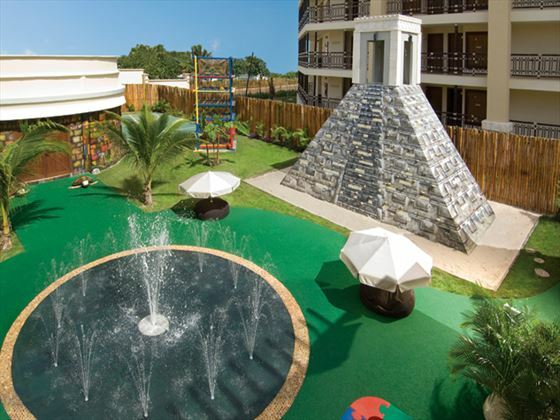 The Mayan-themed club offers a Chichen Itza climbing wall, fireman’s pole and water fountain, planetarium with constellation dome ceiling, sandcastle competitions, arts and crafts, ocean trampoline and a weekly campout adventure and big screen movies on the beach. Beepers are provided to parents to give extra peace of mind. Babysitting for children (chargeable - min. 3 hours). There is also a wide variety of activities for teens through out the day and night. Other activities include beach and pool volleyball, beach Olympics, cocktail lessons, cooking lessons, darts, Mexican bingo, Spanish lessons, Euro-bungee, table games, Weekly beach parties, climbing pyramid, big screen movies by the barefoot area and much more. Mobile app with an up to date schedule of all events, activities, restaurants, excursions, local destinations and more! Sorry, there are currently no prices available for your selected options. Please change your options or call us on 066 7164410 (Tralee) or 01 6649970 (Dublin) for a quotation. Located just outside of the quaint fishing town of Puerto Morelos, with tropical trees, glistening white-sands and views of the beautiful ocean. 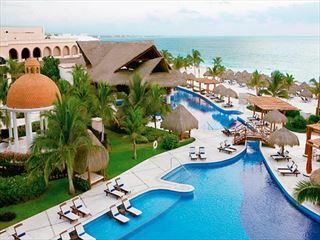 Enjoy the town in style with Now Sapphire Riviera Cancun's Unlimited-Luxury® benefits.